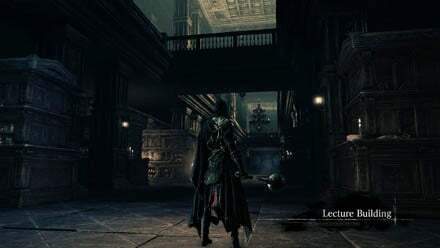 Lecture Building is a location in Bloodborne. Great One's Wisdom - After exhausting dialogue with Patches the Spider it might happen he commits suicide and when you go back you get the item. This location is connected to Lecture Building 2nd Floor by a ladder. You'll wake up in a poorly-lit side room that contains nothing but lamp, so light it, then head through the door on the left. Directly opposite you is another door, if you interact with it you'll get some delightful dialogue from Patches The Spider. Once he's finished his little speech, head back into the main room. You'll come across two doors on either side of the room, the door on the right can't be opened from this side, so head into the one on the left. In this next room, there'll be a collection of desks but nothing of note, so head through the next door in this room. Prepare for a jump scare as when you walk in the room a Slime Scholar will fall on top of you and deal some damage, so don't hover at the entrance too long. Dealing with this enemy is easy enough as it only has a small amount of HP. The teacher's desk at the front of the room holds the Lecture Theater Key, and the body in the middle of the room can grant you the Student Set. The door on the other side of the room (from the door you came in through) exits back to the end of the main room. Enter the double doors at the end of this room to be transported to Nightmare Frontier. There a couple more doors on the sides that can be opened. The first door on the right, is locked from this side. The second door on the right can be unlocked using the Key you've just obtained in the other lecture room. BE CAREFUL! As soon as you open the door, you will be swarmed by Slime Scholars. This is a good place to farm for Sedatives, as well as Blood Echoes. Once you clear this room, head right to open the door into the room you couldn't access from the other side. Find a chest in the corner containing the Augur of Ebrietas. You can open the door to the main hall from here too. Through the final door on the right, find a chest with 2x Red Jelly. While the final door on the left opens you up to a round room where you can treated to 2 Madman's Knowledge, and an ambush from a Slime Scholar. Now you can leave through the big doors at the end of the hall; exiting the building on the first floor leads to the Nightmare Frontier. Someone really should mention about the 2 hunters that lead to this area. 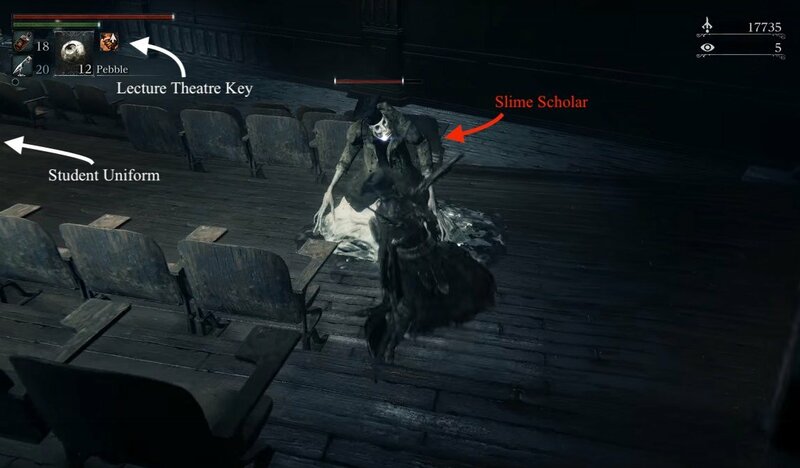 It&apos;s implied this location is a part of Byrgenwerth, but that the Lecture Hall itself is "adrift in the Nightmare," according to the Lecture Theater key. I wonder if that sealed trapdoor in Byrgenwerth would have just lead down here? Willem&apos;s rocking chair is found in the Lecture Hall in the room with Patches, after all. Except, this place has quite a few windows, which would be pointless in an underground space... unless they look out under the lake, which would be impressive, and not all that surprising considering the school&apos;s fixation on water and its connection to the cosmos. In U.S., ground floor and 1st floor mean same thing, so that might be the confusion there. Just FYI. Who knows anything about him? Topic. I&apos;ve run all around that area, but I either just didn&apos;t see a ladder? Or something, or else I&apos;m missing something. 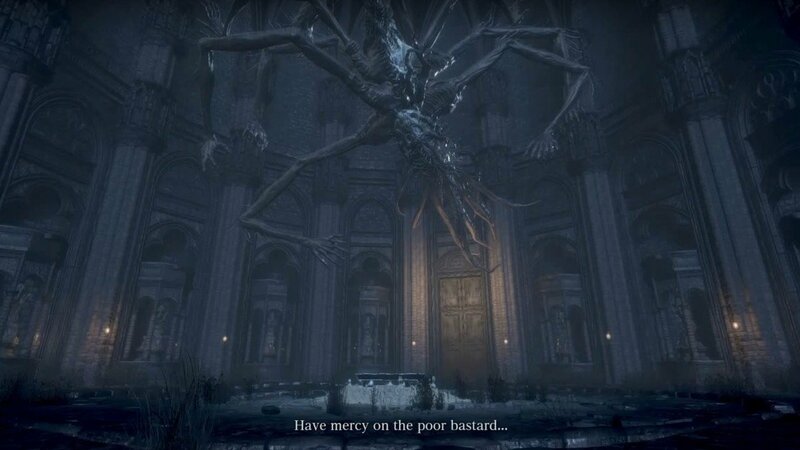 I can&apos;t get through the spider door even after defeating Amydala. Now I don&apos;t know what the deal is if you don&apos;t have access to this area yet, or why it happens, but for anyone familiar with DaS2, iirc if you died and turned off the game your bloodstains would still remain where you died. 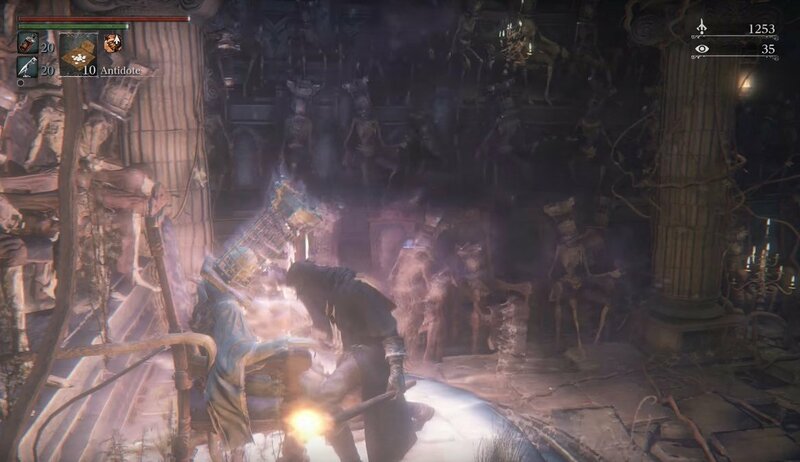 In Bloodborne, however, if you die, leaving your bloodstains somewhere, and turn off the game, they won&apos;t be there - I had lost to logarius, came back the next day and could not find my echoes as I killed him. Looking up potential glitches about it I found and confirmed it right after that your echoes will end up HERE for you to safely claim, right outside the the 1st floor lamp. 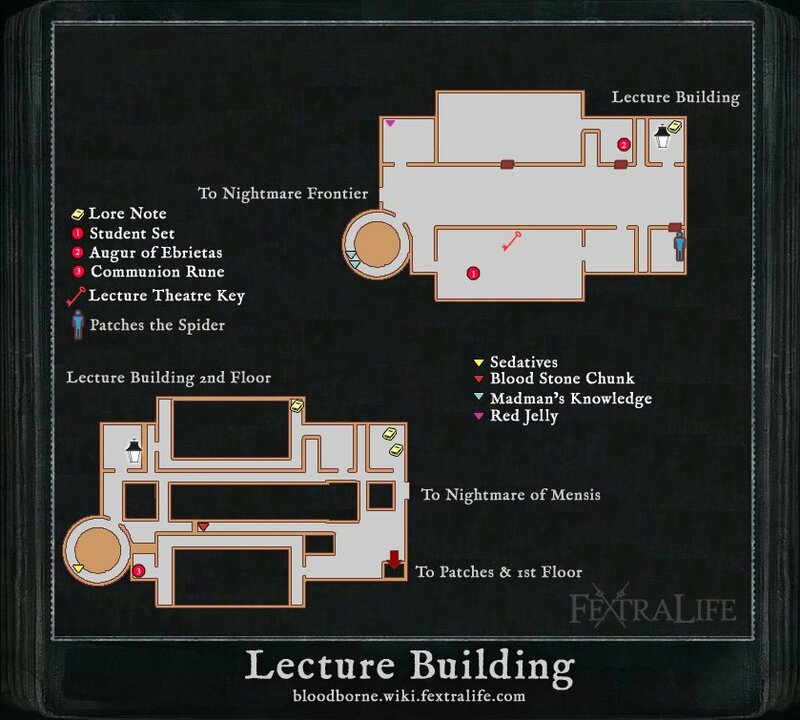 Could these lecture halls be under Byrgenweth in that trap door you can&apos;t open and that&apos;s why there&apos;s no ground floor. It could be true as Rom is a great one (like Amygdala in the nightmare frontier) who resides under the lake as in under ground level where these lecture halls could be. My theory is the nightmare is like a sphere that surrounds Yharnham. Go up or down far enough and you&apos;ll get close. The amygdalas that try to catch you are invisible until the blood moon comes down. My theory is that killing rom made the nightmares grip tighter on Yharnham revealing them. And the old labyrinths are also underground. This could also explain the architectural structure of Yharnham and why it always keeps building up. Where is the Ladder in the 1st Floor? or do you need to reach the second floor without the ladder? I went to lecture building using tonsil stone, however i mistakenly open door to nightmare frontier without lighting the lamp in the first place in the lecture building. now what can i do to return back to lecture building? please advice. I have the tonsil stone but when I run out to where Amygdala&apos;s hand is he actually teleports me to the gate just a few feet away taking quite a bit of HP with him. Do you also need to be able to see him (have 40 insight)? Think it&apos;s better to try in New Game + or start over on a new character? To the funny note yes they may have fallen asleep in class... but for the XP(or w.e) run they are the ones yu let kill you.... lure them.back a bit and there yah go..
Not sure if this has been pointed out but there&apos;s some sort of coin on the wall in the Lecture Hall, which I haven&apos;t seen anywhere else. From the lamp take the first door on the right to find yourself in a small anteroom outside one the area&apos;s theaters. head to the wall opposite the entrance and turn left, between the wall and the closet/cabinet. At the end of this short corridor is a coin or a disc on the wall. I haven&apos;t been able to interact with it but I wandered around the rest of the area and didn&apos;t see it anywhere else. Any ideas? It is the best grinding stop I have found yet. The Slime Student are very weak to fire and drop bullets, so you just have to go there with a flamethrower and a hunter torch. You open the door, lure the Slime Student out and wait for them in the door frame with your flamethrower. 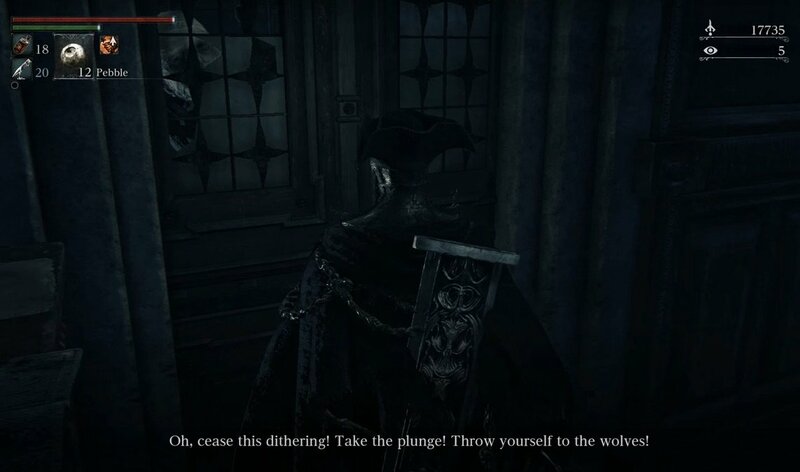 Then you respawn, either by consuming a Bold Hunter Mask or by letting the last Slime Student kill you (don&apos;t forget to retrieve your blood echoes). Including the loading it takes me maximum 4 minutes to make approximately 15000 Blood Echoes. This is the easiest and quickest grinding spot I know of, tell me if you know a better one.